Ever since the launch of the Bulldozer range and 9-series motherboards, the initial reviews of the processors were not encouraging to say the least. Since then, AMD has decided to pull out of the enthusiast end of the CPU market, to focus in on the mainstream and low power processors. This is despite the fact that Windows 7 (and Windows 8, natively) is now receiving updates so the operating system can understand the processor architecture a little better, and hopefully boost performance. This gives a second wind to those owning (or thinking of owning) a Bulldozer based processor, and in turn, a 900-series motherboard. With the updates in hand, today we are looking at five 990FX boards that may feature on the consumer or system builders’ radar. This roundup has been on the cards for a long time, but unfortunately has had to be continually pushed back and then retests applied with latest BIOS updates – but as belated as it might be (and as deeply apologetic as I am), here it is! In a trend of compatibility, today’s Bulldozer architecture and Zambezi processors are all wrapped up in our 942-pin AM3+ socket, coupled with either the 990FX, 990X or 970 chipsets. For all intents and purposes, these chipsets are identical to their 800-series brethren, with two differences: guaranteed support of processors based on the Bulldozer architecture (BIOS update may be required), and SLI licensing for motherboards that can take advantage of multi-GPU setups. The 990FX chipset is our focus today, which comes with 32 lanes for graphics (usually in x16/x16, x16/x8/x8 or x8/x8/x8/x8 distributions) and is paired up with the SB950 Southbridge. This Southbridge makes sure that all the motherboards come with six SATA 6 Gbps ports with RAID 0/1/5/10 support and 14 USB 2.0 ports (USB 3.0 comes from controllers) for only another 6 watts of power consumption. We are still limited to dual channel memory, compared to AMD’s high end server offerings which give quad channel and Intel’s various memory channel designs. This is partly cost, keeping AMD chipsets relatively cheaper, and design – moving to a larger number of memory channels would require more pins and routes from the CPU, and thus a new CPU socket. Speaking of sockets, the AM3+ (or AM3r2) and 942-pin design is still with us for the near future. The second generation Bulldozer (Bulldozer Enhanced) and FX processors will still be on the same pin layout and 900 series boards will work with them – the processor should merely benefit from a workload throughput increase. 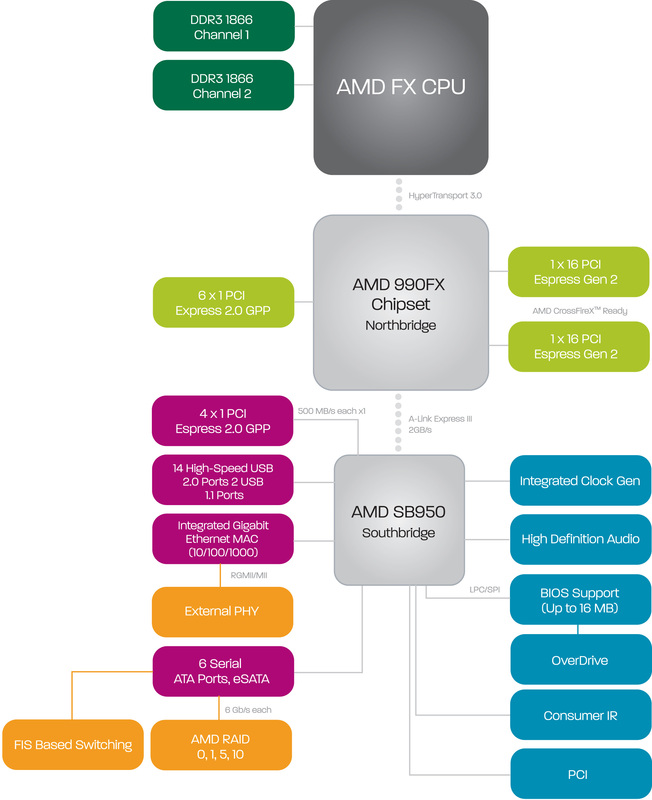 The third generation FX processor, codename Steamroller, is still reported (not confirmed) to use AM3+, meaning that there are still quite a few years left in this platform when taking the AMD route. By default the 890FX and 990FX HyperTransport 3.0 should enjoy transfer rates of up to 5.2 GT/s, unless you use an appropriate processor when HyperTransport 3.1 kicks in to give a 6.4 GT/s transfer rate. With the 900-series, users now have access to a graphical UEFI BIOS, similar to recent Intel chipsets, and also have full support of 2.2+ TB devices. These boards will be tested with both a previous generation Thuban processor (the X6 1100T) and a high end Bulldozer processor (FX-8150), under AMD’s all-in-one liquid cooling solution (which is made by Asetek, and is essentially their take on the Corsair H80). With a wide range of price points and feature sets, let us see what they can do, starting with the ASUS Republic of Gamers Crosshair V Formula.